A guide on how Grab drivers earn from the ride-hailing app’s latest earning scheme. Over the years, Grab has slowly but progressively transformed into conventional travel where it’s now a staple of many workers’ commute today. A large part of that is down to the front-end workers—the people that keep the wheels turning, as they say. But how is Grab attracting such a large number of drivers in such a big region like SEA? It’s pretty simple. The money is decent. I can’t even begin to count the number of times I’ve heard drivers tell me, “Grab drivers earn a lot, that’s why I left my job.” My initial reaction was one of slight skepticism—but it eventually led to me trying it out for myself. What did I learn? Well two things, really. Firstly, the job is a lot more complicated than you’d think. Grab drivers (also known as Driver-Partners) are required to abide by certain rules and regulations that are mandated by Grab. And secondly, there’s more to driving for Grab than just driving around with the meter on. 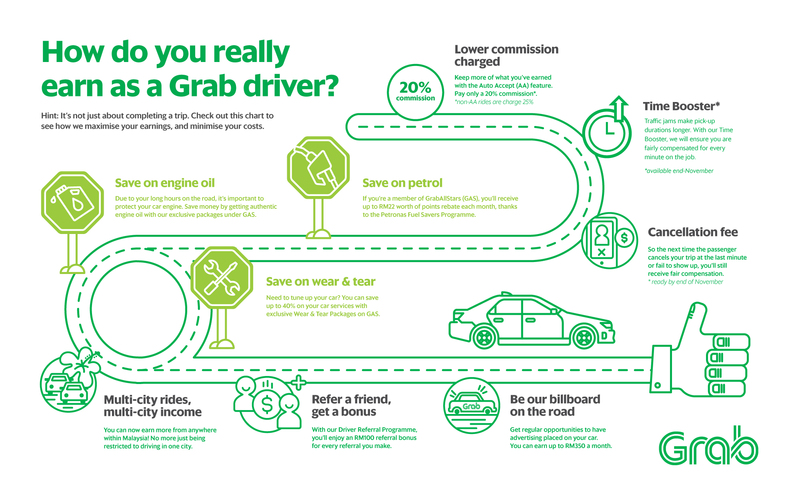 So whether you’re someone thinking of driving for Grab, a current driver, or just a curious bystander, here’s a quick read of what it all entails—and how they bring the bacon home. 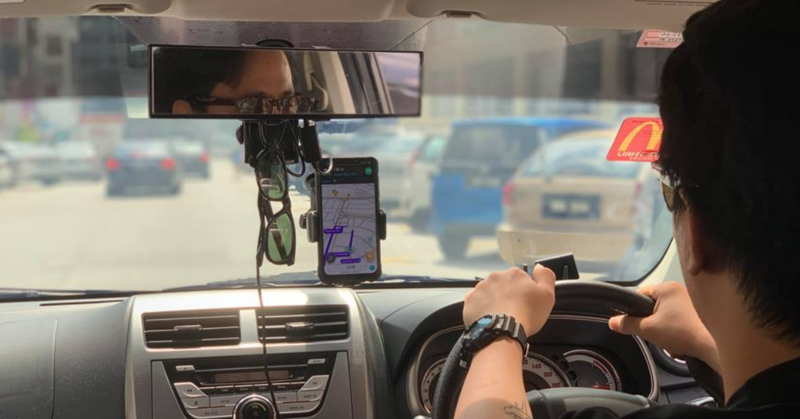 When you drive for Grab, the importance of knowing how the system works cannot be overstated, as how much you earn is very much correlated with how well you know the system. Simply put, this means that upfront fares will be calculated based on the estimated trip time in addition to the estimated distance. According to Grab, the reasoning behind this is to further compensate driver-partners that drive during peak hours. Under the previous system, completing a 10KM trip that takes 30 minutes to complete would’ve gotten the driver-partner the same fare as a 10KM trip that takes 15 minutes to complete. Therefore, jobs done during peak hours and in busy areas will result in higher fares, while trips that take a shorter time to complete will generate lower fares. This new update is essentially Grab’s latest incentive scheme—replacing the previous Hourly Guarantees and Flexi Bonus incentive systems. Basically, every different hour has a certain Time Booster level (eg. 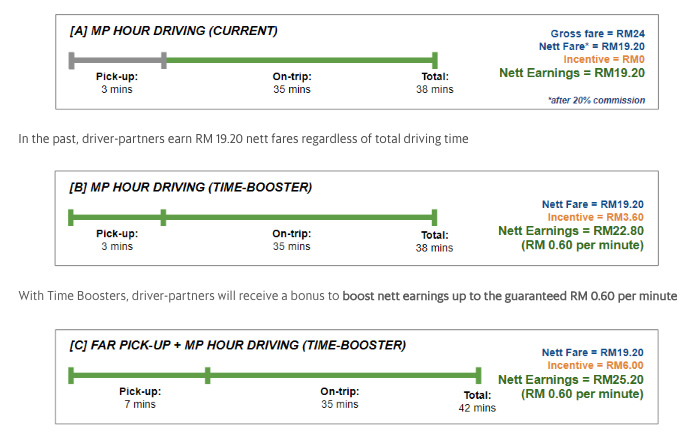 RM0.60 p/minute)—if your trip is estimated to take longer due to a change in traffic such that your average earning per minute drops below that level, you’ll receive a bonus to compensate for that. In a nutshell, the biggest change for driver-partners under this new system is that they are now compensated in a fairer way when they drive during peak hours. Of course, but hear me out. Over the years, Grab has implemented quite a few things that drivers have complained about—a good sign, surely. There are a couple of useful perks that come along with the gig besides the incentive payments. Drivers are allowed to pay a discounted 20% commission (the normal is 25%) if they turn on “auto-accept”, a feature where the next rider request is automatically accepted. Self-wrapping your car with an advert? It nets you up up to RM350 a month. They’ve also given drivers a guarantee of RM1/km at least, with Grab topping up the difference. Something most drivers I know would appreciate is how you’re now compensated even if your passenger has canceled their request. Previously, the bane of many a driver has been the last-minute cancellations from potential customers that cost the driver—both in time and petrol. There are also Grab All-Stars privileges that include a certain amount of savings on fuel, maintenance, or even recreational outings. Another way of making a little money on the side here is to refer new drivers onto the platform—each referral gets you a RM100 reward. Particularly for part-time drivers, Grab’s system now works in that you can drive across multiple cities/states without any extra registration. As long as there are riders in the vicinity, you can expect to be able to work in any of the available cities. So Is That Driver Telling The Truth? The answer to such a loaded question: generally, yes. However, taking the time to understand the system and having the diligence to learn to utilise it properly can have a huge effect on what the driver actually earns. Grab’s system has evolved over the years from one that just paid well to one that actually provides a more rounded benefit scheme in rewarding its (longstanding) drivers. Just like anything else worth pursuing, it takes a little learning on-the-go in order to fully realise its benefits. In other words, driving for Grab can be a good source of income—as long as you make the effort. To find out more information on becoming a Grab Driver-Partner, you can click here. This article is written in collaboration with Grab.